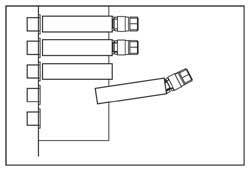 Truck bays involve the physical layout of the dock doors and dock levelers. The most common dock arrangement is a flush wall with doors spaced at minimum 12'0" centers. The greater the width the easier and safer the loading dock operation will be. Twelve-foot centers allow for an overall truck width of 10'0" including the trucks side mirrors. The criteria for the number of loading dock bays is based on many factors, as follows; the number of trucks received per day, delivery schedule, number of pallets safely unloaded/loaded per hour and the number of staged trailers at your dock. Bottlenecks should be avoided and the trucks should be able to move easily with a minimum amount of maneuvering and a wider 14'0" bay can provide this ease of traffic. The 14'0" wide truck bays typically permit a staging area between the docks. It is also important to consider the temporary storage or otherwise known as staging area. A 60' long trailer 8'6" wide requires a minimum of 510 square feet of staging area and can be loaded to a height of 10'0". Note: Each client's staging area requirement may vary, so we recommend that you consult with your client to find out exactly how much staging area is required for your project.